TED-Ed Clubs offer students the opportunity to discover, explore, and present their big ideas in the form of short, TED-style talks. Connect Week is a chance for TED-Ed Club Members in different parts of the world to gather together at one time, in one place, to talk about ideas. This global community event is one of the coolest things about being in a TED-Ed Club. The next Connect Week is happening November 2-9. 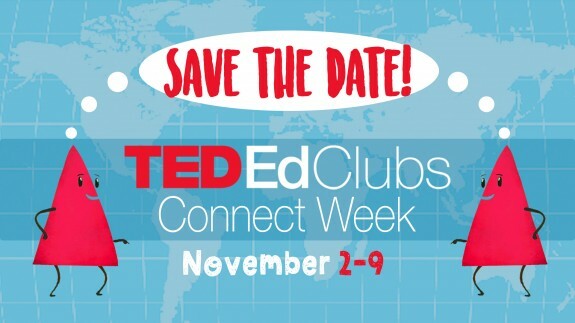 If you’re thinking about starting a TED-Ed Club, join in this Connect Week! For more information, read on. To participate, register here. Connect Week brings together hundreds of students to talk about ideas in hour-long online video calls hosted by the TED-Ed Team. Each video call is a chance for students in different Clubs to share everything from their favorite video games and holidays to their thoughts on mushroom suits and hoverboards. During a video call, Club Members also share their ideas with each other and give supportive feedback as they prepare to give their talks. You don’t need special software to join — if you have a phone or internet connection, you’re all set. To see what Connect Week is all about, watch this video! Come as you are. Whether you’re thinking about starting a Club or just filled out your End of Cycle survey, Connect Week is great no matter where your Club is in its cycle. Get your whole Club involved. The more ideas on a call, the more inspiration we can generate. We’ll also make time to share things like: What do people eat for midnight snacks where you live? What YouTube video is everyone watching right now? What kind of music is your favorite? Be prepared to talk. You’ll be chatting with people who may not know very much about where you and your Club Members are coming from, so get ready to share. Ask questions on the call. You’ll have lots of expertise available to you, so take advantage of that by making sure you bring ALL your questions about TED-Ed Clubs/TED Talks/and everything else with you! Most importantly, talk to each other! The TED-Ed Team will be facilitating these video calls, but we’re going to try to keep our comments to a minimum so you can talk to each other — you are the ones with the best ideas! So grab your friends and join hundreds of the world’s best and brightest TED-Ed Club Members from around the world in the festivities! We look forward to seeing you here. This Rabia Saqib from The Brighton School.We would like for our students to participate in connect week. Kindly share way forward.